Few beverages carry as much history as the ancient Chinese tea; Kombucha, it has been researched throughout recent history for its myriad of health benefits. 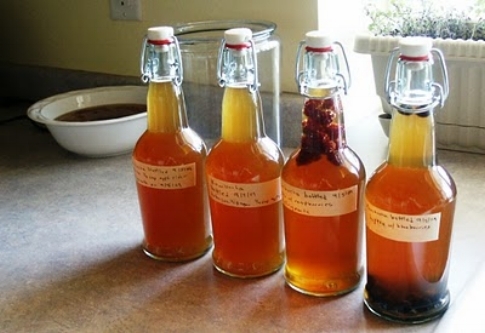 This step by step guide will go into detail on how you can make your own Kombucha tea! First, let's discuss some of the health benefits of Kombucha tea... or you can scroll down to view the recipe. Because Kombucha tea is full of in the same enzymes and bacterial acids your body uses to detoxify your system. When regularly ingesting Kombucha tea, you ease the responsibility of your liver on cleansing toxins in your body, this allows it to focus on other tasks. Being rich in glucosamines means that Kombucha helps the body to maintain tissue structure, moisture, lubrication and flexibility and lessens free radical damage. It converts into the fluid that is used to lubricate the joints. Kombucha provides about 25 essential bacteria and yeasts to your gut flora, thus aiding in digestion, fighting yeast overgrowth and boosting mental clarity. It is noted for alleviating some of the symptoms associated with depression and anxiety. Some further reported benefits of Kombucha are its ability to boost energy levels, suppress appetite, fight harmful bacteria, help control blood sugar, reduces the risk of heart disease and manage type 2 diabetes. Click the links above to read the studies that were carried out to support these benefits. 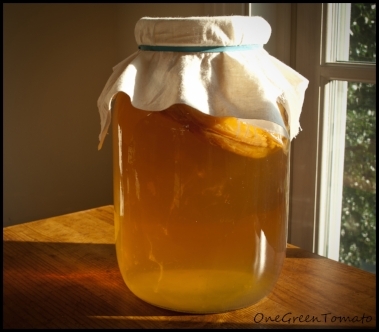 1) Obtain a SCOBY (symbiotic culture of bacteria and yeast). Click here to purchase from Amazon. 3) Dissolve 1 cup of white sugar and then let it cool until it reaches room temperature. Remove the tea bags once you have finished steeping them. 4) Add one 8-10 oz "starter" Kombucha (either a bottle of Kombucha bought from the store or saved from an old batch of fermented Kombucha) to the gallon glass jar. 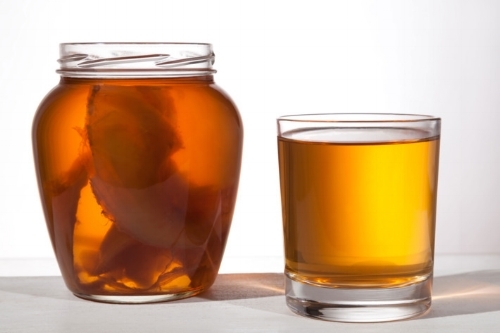 5) Add the room temperature tea, then place your SCOBY on top. Put a paper towel over the top of your jar and use a rubber band to secure it. 6) Place in a warm area (72-78*F). Let this sit for 7-10 days in a place without direct sunlight. The longer it ferments, the more vinegary and sour it will taste. 7) 1 gallon will provide you with you four 24-26 oz bottles of Kombucha and one 8 oz “Starter” Kombucha for your next batch. You may have some left over…save this as starter! 8) I use a cheese cloth or coffee filter and pour my Kombucha brew into a pitcher. This makes it easier for the next steps and sifts out any large pieces of SCOBY. 9) Using your funnel will make this step easier. Flavor your flip top bottles with any flavor you want! I use all organic, cold pressed juices and essential oils. You want about 20% juice and 80% Kombucha tea. Then I add more sugar to each flip top bottle to help with carbonation, typically 1 tbsp, no more than 2 tbsp. If the juice has a lot of sugar, I add only 1 tbsp. If it does not have a lot of sugar, I add 2 tbsp of sugar. I have 25 oz bottles and use 3/4 cup of juice and the rest of the bottle filled with Kombucha up to the neck. 10) Let your bottles carbonate in an equally as warm place as the first fermentation process, and let them carbonate for at least 3 days. If you leave it for longer then be sure to “burb” the bottles, releasing some of the pressure build up. 11) Put all the bottles in the refrigerator to slow further fermentation and enjoy! 12) Enjoy your lovely Kombucha tea and all the health benefits it brings to your life! Click here to buy a Kombucha Starter sample or buy a complete guide along with Glassware and ingredients from here. A huge thanks to Julie from @EatPlayCincy who put together this guide for us! Check her out on Instagram and feel free to ask her any questions you might have. As always you can use your Akasha bottle to keep your Kombucha nice and cold, perfect for a hot summers day! Use code KOMBUCHA for 10% off at Checkout.